@PBCool, what do the below results mean? It means you have quite a bit of packet loss on your line at 100mbps. If your actual line speeds is 100mbps, please re-run the test at a bit lower than your 100mbps rate, e.g. 80mbps. @TheRoDent any news with Octotel southern suburbs? Hi, no feedback from them yet. Can you PM me your address name, contact number, and address details so that I can get a probe installed with you ? @MDE Do it man. Those black boxes save internet lives...lines. I'm also on Frogfoot 100Mbps. noticed latency through sacs cable to Miami not what it used to be...about 30% higher. Looks normal. 154.0.4.158 sits in London on the CISP network. What have happened in your traceroute, is that CloudFlare rerouted to London for a short while there. Could be for many reasons, either CISP busy with network maintenance and a blip happened in the routing, or CloudFlare is busy with maintenance and they stopped advertising their SA ranges for a short while. related to my CI/VT contract, does anyone have a contact at Vumatel? I have been trying to get my line checked since December, as it is intermittently slow on both wifi and cable, without reason. Vumatel insists that I have to work through the ISP, Cool Ideas, who booked a call out. Vumatel missed two appointments to come out, and then cancelled the call due to "insufficient information". I'd like to follow up. Also, recommendations for another fibre provider are also welcome. Vumatel not working for me and the Cool Ideas relationship achieves little. @PBCool no internet here at the William. Tried tech support, no answer as it is after hours. Can anyone help? Sitting with a problem on my MFN line certain things are working correctly but others are not. I have logged a ticket with yoursupport but the response I got has not resolved the issue at all. 18 minutes on the phone, it was suspended because I forgot to pay. Reactivated by tomorrow in theory. Still not reactivated 2 days later. And I'm leaving tomorrow so it's now useless to do so. Why don't you call again? Personally would have thought it's a sales issue, and most places' sales people only work weekdays. I wasn't home yesterday, came back at lunch today am leaving tomorrow morning so I'll leave it here. I'll probably cancel fiber soon anyway, I'm hardly home 2 days a week and when I am I spend most of the time out. FFS! Anyone else having issues? Nope, 145ms latency and normal download / upload to Europe. Frogfoot 100/100, Cape Town. Sorry, should have mentioned, I’m on Vuma Aerial 200/200 in JHB. Yeah, seeing that tonight too. Openserve slow for me as well tonight for the first time in a while.... anthing going on? Yeah, on openserve too. 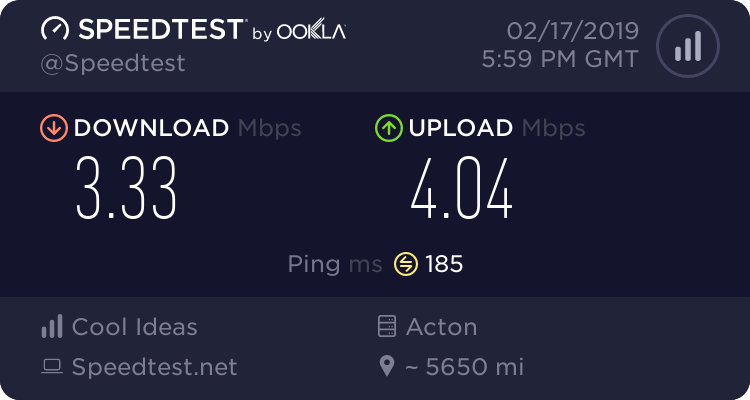 Local seems okay but with a higher ping and international not looking great. Can't watch Twitch.